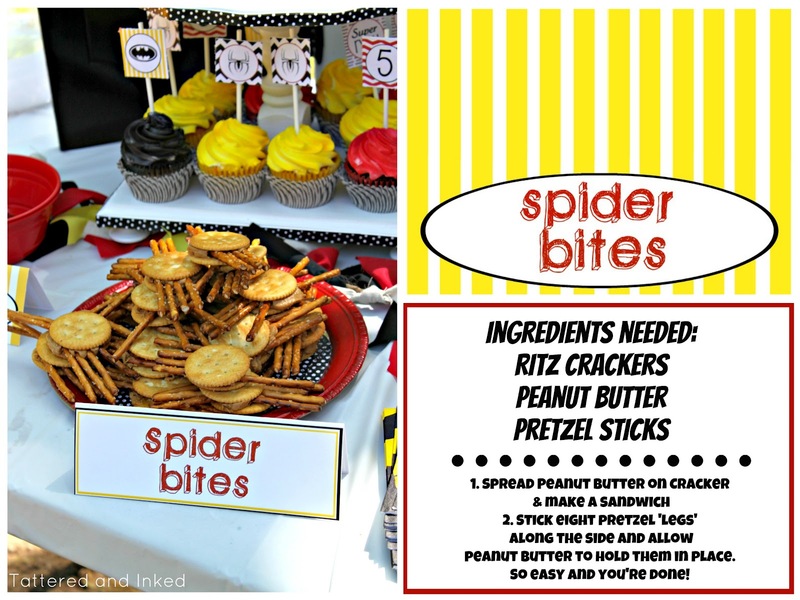 Tattered and Inked: Superhero Food Ideas & Free Printables! Did you get a chance to check out my superhero party post yesterday?? Cuz if you didn't, you should definitely check out all the super-awesome fun we had going on! I told you I'd be sharing details of the party throughout the week and I'm definitely trying to do that in between packing to leave for two weeks and finishing up all my finals!! it's craziness, people. Just craziness. This part of party planning was probably my favorite this year. 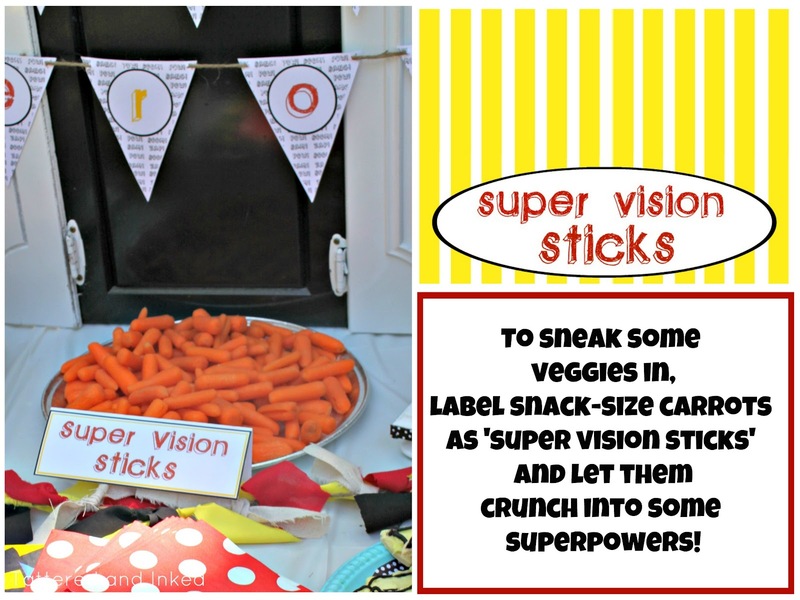 Little man had tons of fun coming up with fun ideas and we both got to go 'superhero food shopping' which he thought was the coolest thing ever! I found some great ideas via just google and then we came up with some on our own. I mentioned in the original post that I got the way cute cupcake liners from Hey Yoyo on Etsy! So cute and I just slipped them right over the store-bought cupcakes. I was surprised that these guys were the biggest hit of the snack food! These were also the ones that little man told e.v.e.r.y.o.n.e. about before the party. He was fascinated about having 'catwoman claws' even though he had no idea what they were-haha! I prepared them the night before and little man loved helping to make the spiders. They're yummy everyday snacks too...just sayin'. 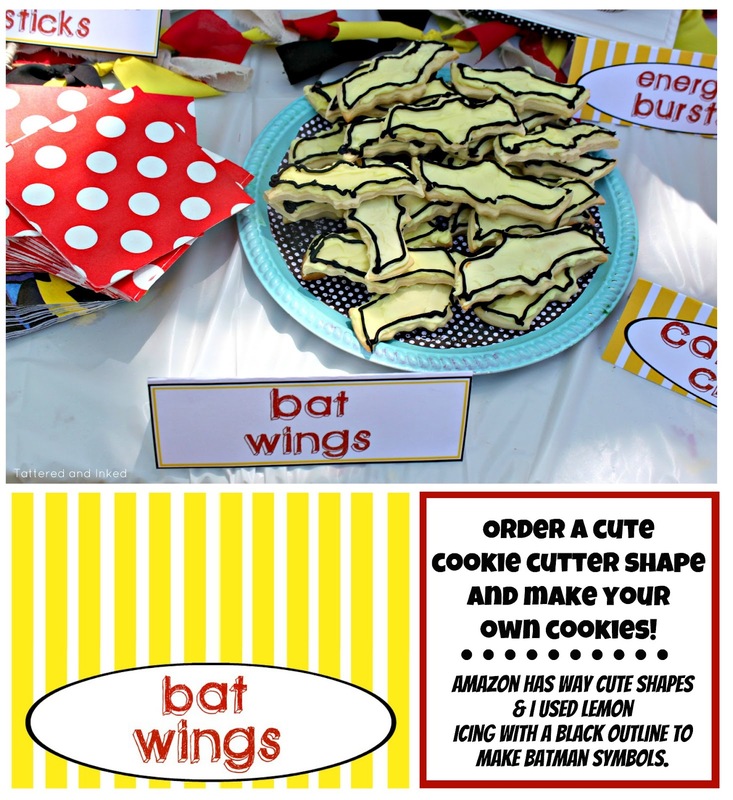 I found a way cute batman-shaped cookie cutter on Amazon and me and my mom whipped up some cookies a couple days before the party. We used lemon icing for the yellow and they were yummmmy. Like how I sneaked some veggies in there? 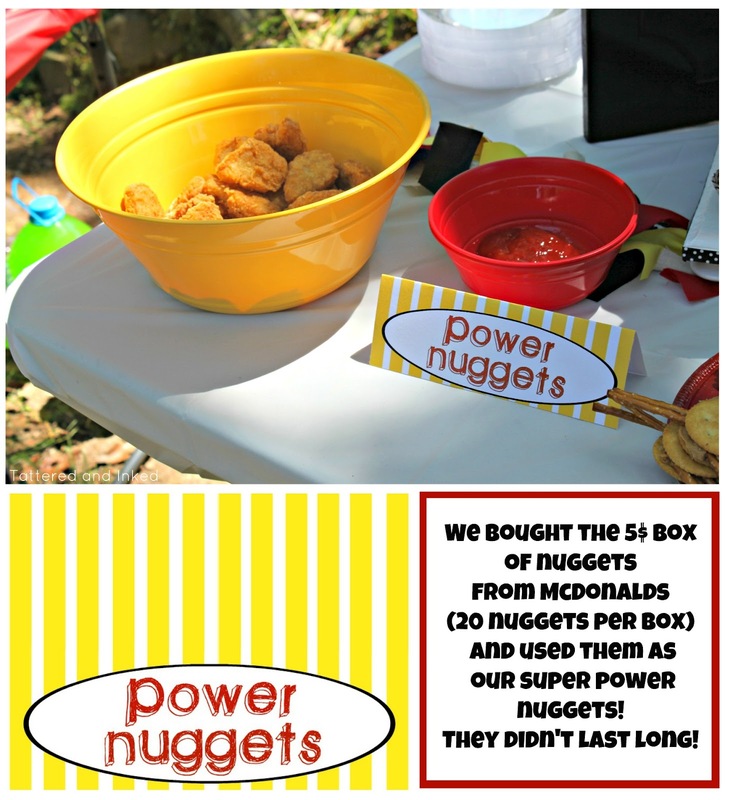 Little man insisted that chicken nuggets had to make an appearance at the party and McDonalds has a 20-count box for 5 bucks. So now onto the really good stuff!! I designed some super easy food labels to set out on the food table and thought you might want in on the action. Just download, print, cut out, & fold in half for a way easy pop of color and a 'super' food table!! I mixed and matched with my two designs for my table so it's totally up to you on how you want to do it! 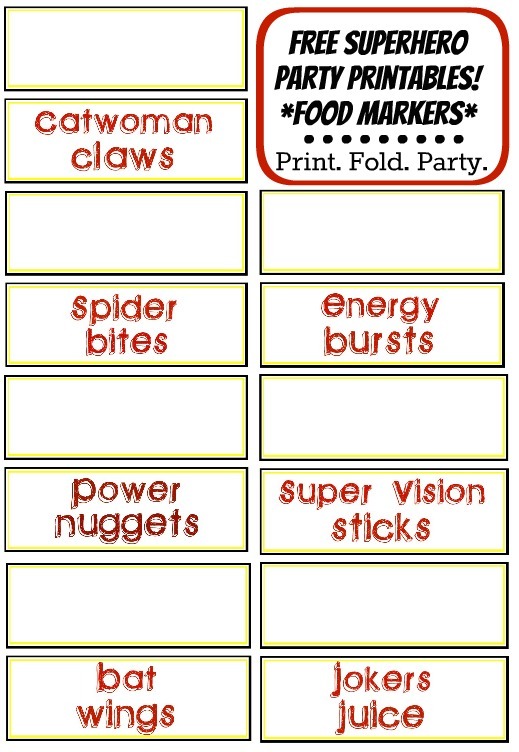 I also have links to blank food labels so you can add your own names!! So have at it & I hope it helps in adding a little awesomeness to your own superhero parties!!! I'd love to see how you use them!! 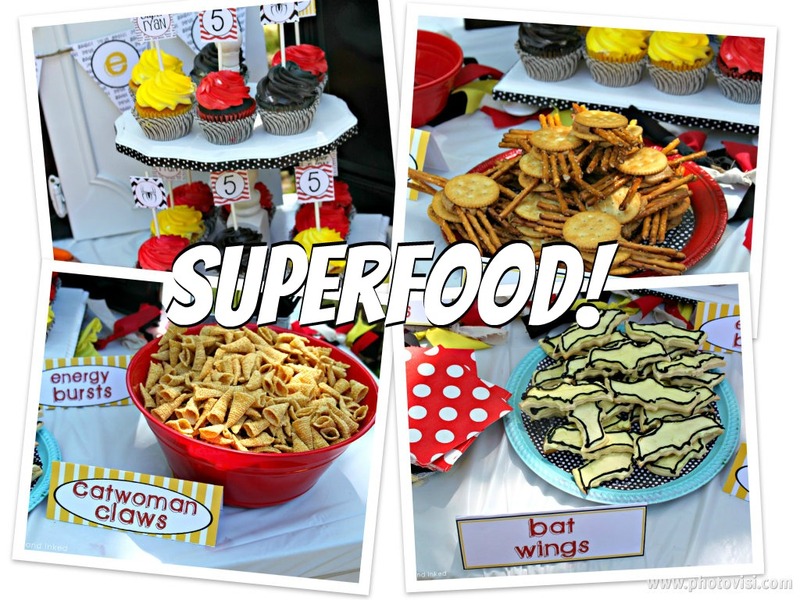 Hope you enjoyed some fun superhero themed party food and it got your own creative juices flowing!! I'll be back tomorrow with some more superhero fun! For a full list of all my superhero printables, visit the bottom of this post. I love this! 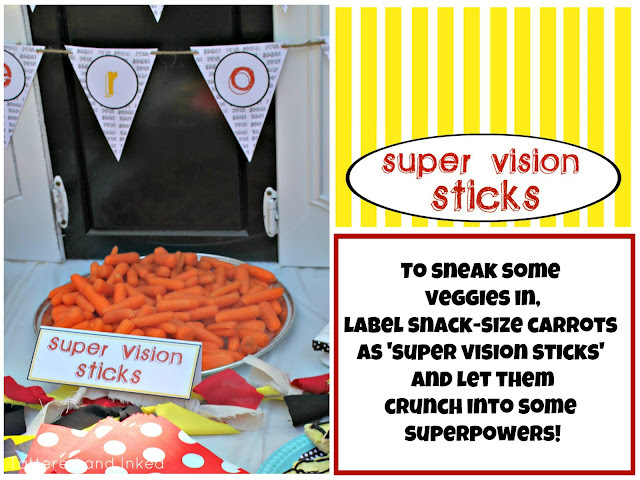 We would like to have a Super Hero party for our little boys soon! You've given me a lot of good ideas! 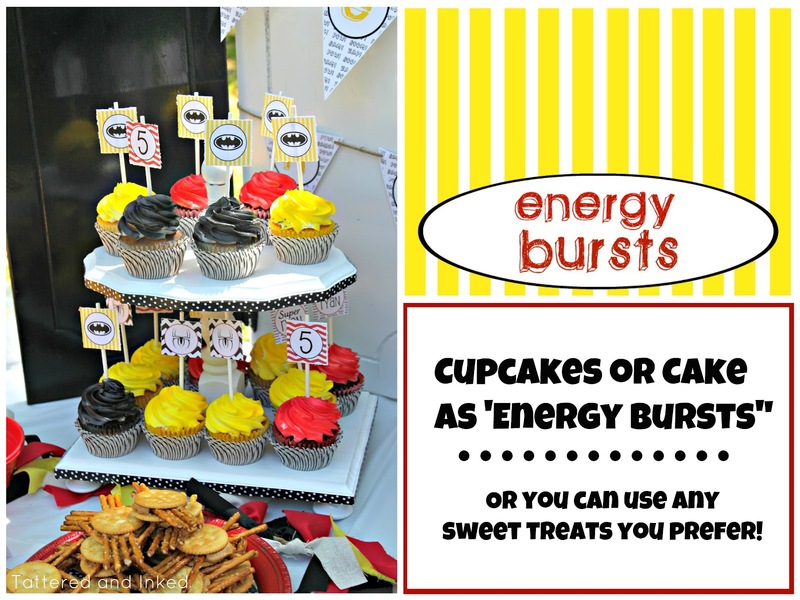 Love the printables!!! Thank you so much for sharing. I'm using them this weekend for my son's 4th b-day. Can you tell me what font you used? 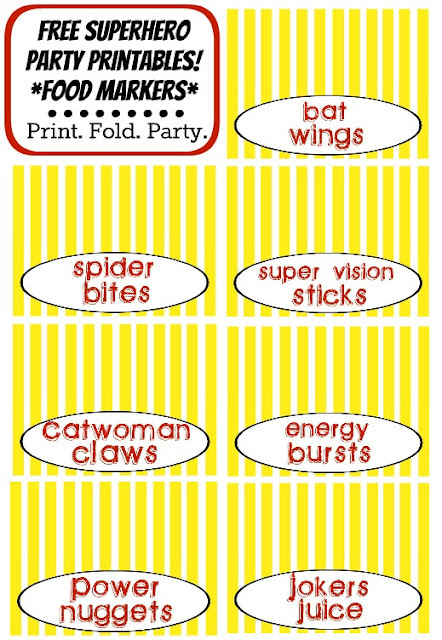 I'm making my own goodie tags and I want to match the font. Thanks!! I agree thank you!! These prints are very useful! 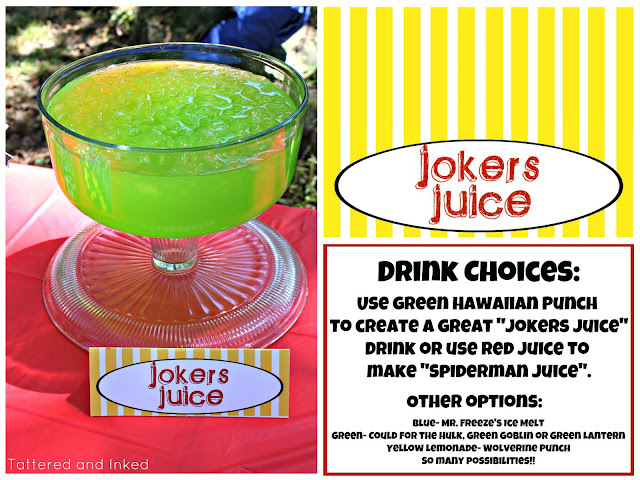 I used these for my 4 year olds Batman party. Thanks so much!! Very creative and great idea!! The cupcakes and spider bites seems delicious.I am planning to organize a party on the 25tth marriage anniversary of my parents. 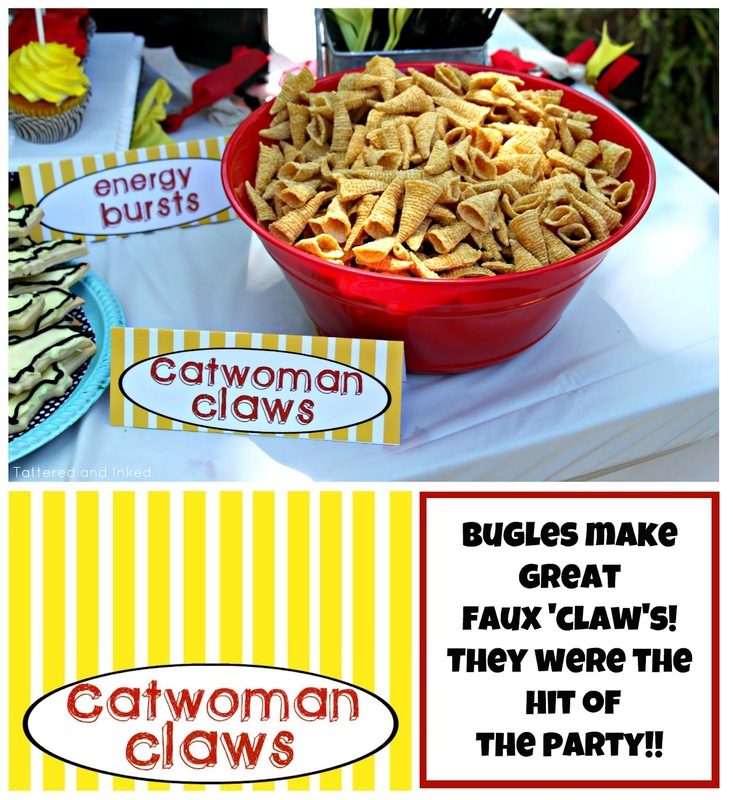 I will definitely include these kind of eatables in the party. This is all amazing! 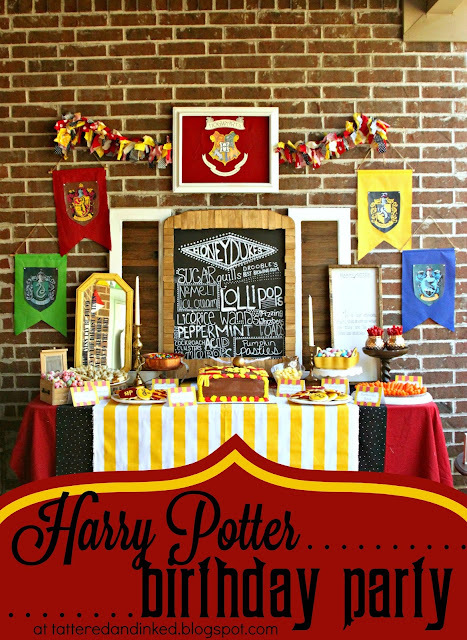 So many ideas for my party! Thank you so much. These are awesome!!! Thanks so much. I am using them for Super Hero night snacks at Church for Awana's. I'm sure the kids will love them.